Is your Outlook program taking too much time to respond? Are you unable to perform even the basic operations like opening a file, copying a folder, or downloading the embedded attachment? It seems you’re dealing with an oversized PST file that has reached or crossed the maximum size limit. The fact says that an oversized PST file is highly prone to corruption. Also, you may face some serious performance issues while using the Outlook client. In order to prevent corruption and Outlook performance issues, you need to split PST file into two or multiple parts. In this very article, I’m gonna show you how to do that. Have you ever wondered why an oversized Outlook data file is so prone to corruption? Being an avid Outlook user, you must be familiar with the PST file size limit. The Outlook client saves the PST file in two formats: ANSI and Unicode. Microsoft Outlook 2002 and earlier versions use ANSI format that has a maximum size limit of 2 GB. On the other hand, Microsoft Outlook 2003 and later versions including the latest 2016 use Unicode format. A Unicode PST file can store the mailbox data from 20 GB to 50 GB. Outlook stops responding for a long time. And the problem doesn’t end here. In fact, the situation goes from bad to worse. Because when a PST file crosses the maximum size limit, corruption is likely to happen sooner. You may lose the important emails and other mailbox data due to corruption if you don’t fix the issue in time. 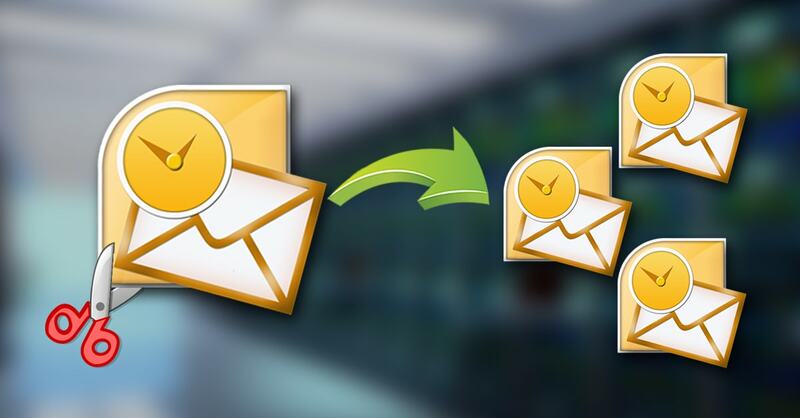 Learn how to repair PST file by using the Inbox Repair tool. How to Handle an Oversized PST File? Either you can import or copy the mailbox data from the main PST file into multiple new PST files. Or, you can use a professional PST Splitter tool to split PST file. First, let’s start with the DIY trick that requires no cost at all. Microsoft Outlook client contains a few built-in features which you can use here, such as Archive, Import & Export, and Copy to Folder. If you use the Archive feature, the Outlook client will create an archive file containing the mailbox data (folder and subfolders) you’ve archived earlier. You can save this archive file at any location by any name. 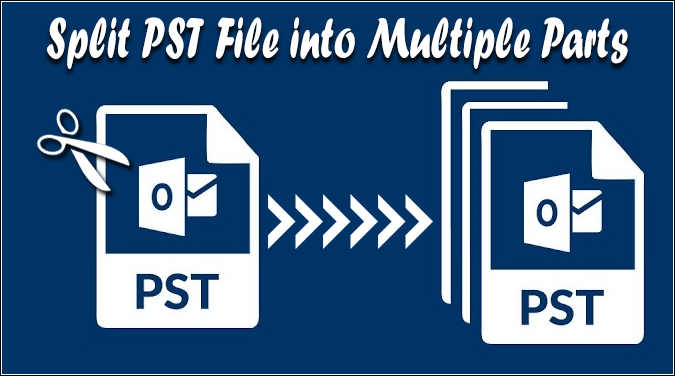 In the same way, you need to create multiple archive files in order to split PST file into multiple parts. Additionally, you can use the Import & Export and Copy to Folder features to import the mailbox data. Let’s suppose that you want to split PST file into four parts. First, you need to create four new PST files. You can name them Output1.pst, Output2.pst, Output3.pst, and Output4.pst. And after that, you can import, copy, or move the mailbox data from the main PST file into the 4 new PST files one by one. Make sure you take a backup of the original PST file before you can try anything here. Sometimes performing the DIY tricks turns into a cumbersome task for Outlook users. To be sure, this generally happens when the PST file size is really very big and it contains a large number of folders and subfolders. The DIY tricks literally involve a lot of time and manual effort. So if you’re looking for a quick, effective, and effortless way to split PST file, you should get the professional PST Splitter tool right away. There are many vendors in the online marketplace who provide such software with free trial version. You should always evaluate the software before you can purchase it. Effortlessly split Oversized PST File of any size, i.e. there’s no such size limitation. Support both ANSI and Unicode PST files created by all popular versions of MS Outlook. An instant and safe solution, i.e. it just takes a couple of minutes to split Oversized PST File and keeps the Metadata properties intact. Create new fresh files instead of altering the original PST file. Easy-to-use application, i.e. no prior technical expertise is required. Download the free demo version of this Oversized PST File Splitter tool for free evaluation. By using the demo version, you can save first 25 email items from each mailbox folder of the selected PST file into new files. In order to overcome this limitation, you need to purchase the licensed version of this PST Splitter tool. In this article, we’ve discussed how an oversized PST file can cause severe problems like performance issues and corruption. Also, we’ve learned how to split PST file into multiple parts so the file management becomes easy. A professional PST Splitter tool is always considered the best solution.